The Redefining of Sin – Again | "Northern Crossings"
“man’s will … has no power, without the Holy Ghost, to work the righteousness of God” This is from Martin Franzmann. In other words sin is something that we cannot help but commit because sin is not doing bad stuff, it is being bad to the bone from the moment of conception. Folks including some Lutherans don’t like that much. So we started to redefine sin in terms of knowing that we were acting badly and doing it anyway. You had to understand what you were doing before you could be accused of sin. Paul the Apostle said that because of the inborn sin in him he didn’t understand what he did, but of course that cuts no weight because Paul said that women should not be pastors and spoke against homosexuality as well. Slowly the idea has evolved (devolved) into the notion that the only sin there can be is accusing someone of sinning. Now that is changing. 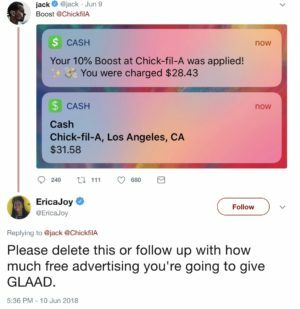 The CEO of Twitter made the mad faux paux, (gasp), of eating a Chick- Fil -A sandwich and tweeting the receipt. He was accused of sinning by the acolytes of the new religion developing in America. How did he sin? He went and bought a sandwich from a company whose CEO, 0(gasp, disagrees with the idea that marriage is whatever someone defines it to be rather than the union of a man and a women. Why a sin? Because he had his chicken sandwich on one of the holy observances of the left, “gay pride month”. I know that Catholics used to not eat meat on Fridays but that was one day a month not a whole month. I’m sure he sinned in the eyes of some other folks because he ate chicken. Of course being a good proselyte of the new religion he promptly put on sack cloth and doused himself with ashes and recanted of the travesty that he committed. Of course some of us think that he sinned by denying there is such a thing as free speech, freedom of association and expression, which was ostensibly the reason Twitter was created in the first place, but that is a story for another time. Others have sinned by wanting to protect the Southern border and after a hard day of ripping children from their mother’s arms going to eat at a Mexican restaurant. Other have sinned by going to , I assume, a chicken restaurant named the “Red Hen” with her family. After seeing a picture of the restaurant I think the sin is taking your family to a place that looks like a chicken coup replete with bird droppings hanging from the awning. Someone else is in hot water for sinning by asking someone if they were, “out of their cotton picking mind”. God had ten commandments and the social justice folks who usually deny His existence have a myriad of rules and regulations that most of us know nothing about. Of course ignorance of the law is no excuse, so beware of what you say. Someone might be listening who has too much time on their hands, hate in their hearts, and sawdust in their heads.